Originally, I suspected these had been modified as is often the case with hoax monkeys, who either twist things to fit their narrative or simply don’t bother to go find decent quality source material open which to base their flights of fancy. After all, the image on the left was used in a well-known composite called “Flag and Earth,” created in 2003 by Ricardo Salamé Páez. 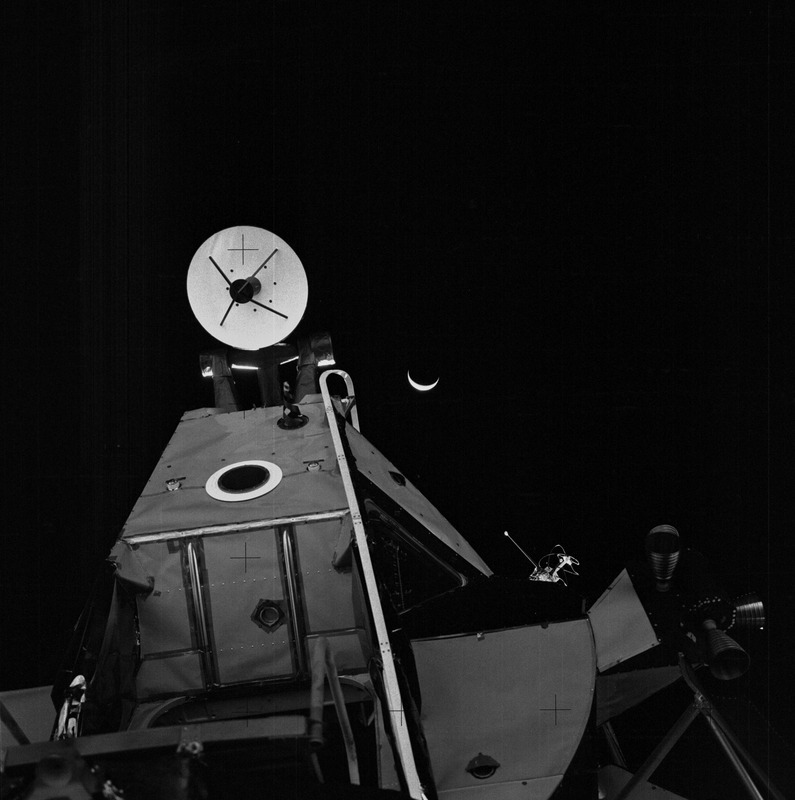 However, good quality scans are available at Apollo 11 Image Library. Neither is from the Data Acquisition Camera. Both are from magazine 40, loaded into the Hasselblad used for the first EVA. The image on the left is cropped from magazine shot 5905. The one on the left is cropped and blown up from shot 5885. So the images are real, just carefully cropped and manipulated from low quality source and presented with a false claim that they are impossibly “billowing” in the wrong directions. How this is any sort of hoax claim is hard to imagine. After all, someone would have to go to a lot of trouble to MAKE this happen, it’s not like a flag would be very likely to “billow” identically in two different directions in two different shots on its own. In fact, the flag is not billowing at all. It’s hanging motionless from a metal rod. The rod is too short for the flag so that the fabric can be gathered like a curtain, to sort of simulate waving, but w the moon, they found the end retained the curl from having spent months packed tightly inside a narrow plastic tube. There may also be static electricity at play, this being nylon in a perfectly dry environment. But okay, it’s a silly claim, but let’s take a look. First the right image. This is the highest resolution available for this image, blown up to match the size of the left image, and I defy anyone to definitively determine whether any of the folds are towards or away from the camera. The only thing clear in this fuzzy frame is that the flag is fairly opaque. It’s hard to tell from this frame, but we know from the log and from the other picture that the curl near the end of the strips is not a simple bend or roll but is bunched, so it makes sense that it will cast a similar shadow on both sides (it is is similar, but not identical). Now the left image. Here it’s quite clear that this is not a flag billowing in the breeze but is creased and crumpled cloth. The “billow” indeed appears to project toward the camera on both sides–it isn’t a billow, it’s a gather or bunch. : The shadow is similar but not identical on each side, and what should be the upper left corner (the little flap protruding a third of the way from the bottom, clearly is on the side facing the camera. Going back, the same protrusion is clearly behind the flag in the right image. And the more you compare the images, considering the stripes are pointing almost directly into the sun, you can see that we are looking at mirror faces of the same, non-moving flag. The fold in the lower stripes in the left image covers one star that remains visible in the right image. A fold at the bottom of the “billow” in the right image is covered in the left. Looking at the ripples where the stars attach to the the rod, the ripples occur in precisely the same spot in each frame, but the prominently lit star in the upper right of the left image is hidden in shadow in the right–the ripples are reversed as they should be. So like everything put forth by the hoax monkeys, close analysis of good source material only counters the claim. I try to be tolerant and understanding of other people’s positions, but moon-hoax conspiracultists really get my dander up. I mean….I mean…no, we’ll come back to that. Dust around the lander. Or something. Lunar trainer impossible to fly. (It was not, except when it broke). But that’s okay. If it will make the world a better place and my blog a busier nexus of nerd-dom, I’m prepared to refute every single claim by any hoaxicanian anywhere, no matter how daft or ditsy–if that’s what you all would like. But first, what think ye of this quick and dirty stab? Does this do it in a nutshell? Want more? Have a few dozen more assertions to add to my list (I’ve heard some doozies)? Let me know. The more the merrier. Why Are There No Stars On the Moon? Moon hoax wackadoos have long complained that we couldn’t have gone to the moon because there are no stars in the pictures. It all had to have been shot on a sound stage. By idiots. Too stupid to think of the stars. Right. 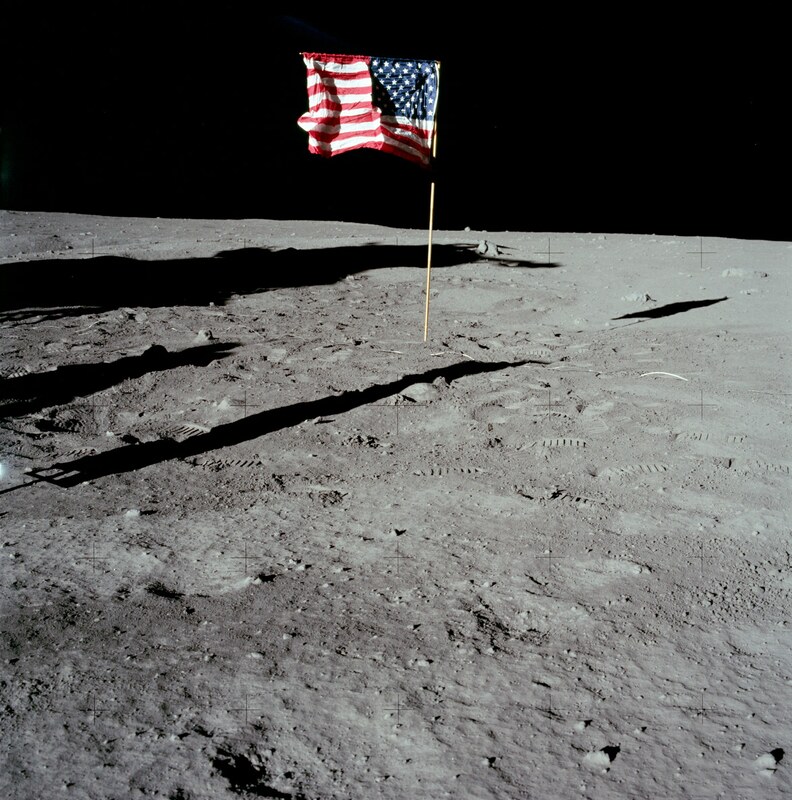 Actually, prominent stars in the Apollo picture would have been suspicious. As anyone who’s ever played around with a camera at night can tell you, stars are only a little brighter than moon hoaxers. We went to the moon in the daytime. When you set a camera’s exposure to capture shiny spacecraft and smiling ‘nauts posing on a gleaming lunar surface, the stars kinda fade away. They ARE there, though, if you look for them. This is frame 5905 from magazine 40 shot during Apollo 11. Stars are clearly visable at full res (http://www.hq.nasa.gov/alsj/a11/AS11-40-5905HR.jpg). That’s Earth up in the sky, and Venus to the right of the antenna. Blow this image up and you can see a number of the brighter stars. The stars are right where they are supposed to be. The only mystery is, why a bunch of numnuts who don’t understand such a fundamental aspect of photography as exposure, presume to attempt photoanalysis in the first place. As always, skepticism is healthy, paranoid delusion, less so. Have your own favorite example of moon hoaxican tripping over their own brains? Leave a comment and share. Increasingly, I am asked by aspiring writers of various levels how they can improve their writing. This is a sufficiently common question, that warrants a sufficiently long answer, that I’ve decided to post the answer here for future reference. Join a critique group. No matter your skill level, the hardest thing for any writer to learn is to see through the eyes of readers. No writing book, course, or lecture can take the place of real live feedback from disinterested strangers looking at your work. Your local writers guild probably has a list of local groups in your area, or if you prefer, there are now many good online critique services. In addition, most good critique sites offer a host of forums and resources that can be invaluable to you. I have tried and can recommend www.CritiqueCircle.com and www.Scribophile.com, both of which have free options. Critters is also a reputable service, though I found it less conducive to building relationships with critiquers and other writers. I can’t personally recommend Wattpad or Amazon’s WriteOn, as they seem to me too focused on the superficial, and I fear they may be designed to feed the fantasy of the aspirant more than to instill the skills of the serious writer. Do not reply to critiquers to explain, justify, defend, or argue. Just say thanks, move on and use or don’t use their feedback as you see fit. Learn to see the truth beneath the comment, even when the comment is wrong. Read like a writer. Read a lot, especially award-winning work in and beyond your genre. Study these tales as instructional samples. Look at formatting and punctuation, especially dialogue and dialog attribution. Move on to pacing, tone, word choice. Some writing gurus advise reading bad prose in order to learn by counterexample. That’s a terrible idea. Humans learn by imitation, and until you have found your voice, you will tend to sound like whatever author you just read, be it Tolstoy’s translator or Edward Bulwer-Lytton. You can, however, learn a great deal by studying the masters from an earlier age and cringing over their self-indulgences. Nathaniel Hawthorn, for example, had a knack for saying something wonderfully, then saying it again (wonderfully) and then again (also wonderfully). This isn’t the nineteenth century. We can’t get away with that anymore, but if we can just come up with one “wonderfully” at a time, we’re good. Stop trying to impress. Beginning writers invariably overwrite. They fluff up their prose with fresh ten-gallon words and flowery description. They invert standard sentence order incessantly. They use metaphors that leave readers scratching their heads, and they use metaphors entirely too much. They try too hard to be philosophical, to pull at the heart, to be dark and obscure and literary. Knock it off. Relax. Tell a good story. Make it clear. The rest will come with practice. Look for the “Telling Detail.” Beginners, lacking confidence, often bury their story under the weight of unnecessary and often repetitive detail. Learn to recognize the one or two key details—in a setting, character, conversation, etc.—that implies everything else the reader needs to know. Better to give one bit of description that implies character and mood, say, than to spell out all three in long winded prose. Master the basics. Become an expert on grammar, usage, punctuation, manuscript formatting, and vocabulary. As a writer, you will often break the rules, but you can only do so confidently and cogently if you know what they are in the first place. And by the way, many of the rules you were likely taught in elementary school are simply wrong. Often, they were contrived to steer students away from common sources of confusion. Learn those sources and avoid them—and learn when to ignore those sorts of rules. Do not for a moment think you can rely on a grammar checker, or tools like Grammarly or Autocrit/Procrit. These can be helpful learning aids. They flag what they think are errors, and you research to decide whether they are right or not. Once you master the basics, you’ll find these tools are no longer almost ever right, and then you don’t need them any more. Don’t accept shortcuts. The late Christopher Hitchens was fond of saying he reckoned “everyone has one book in him….and in the great majority of cases, that’s just where it should remain.” If you want to write as a hobby, that’s fine. It’s great therapy, a sort of thematic extended diary. No one wants to see that, but that’s okay. Meanwhile, there are frankly more aspiring writers than the world has need of. A great many spend an inordinate amount of time complaining that their chosen pariahs (agents, editors, purchasers, publishers, name-brand bookstores, the public, “gatekeepers,” etc. are conspiring to keep their voice from being heard. Well this is nonsense. All those “gatekeepers” make money by getting great works into the public’s hands. They want you to be great, but the cold reality is, if you aren’t, there are always others in the slush who may be. For many writers today, the greatest threat to eventual greatness is the impatient unwillingness to invest in their craft. Don’t be one of the whiners.You have little control of luck and taste, so focus on what you do control, attitude and industry. Write a million critiqued words. No kidding. Ten long novels worth of your best effort, edited and polished, critiqued and revised, and most of it tossed in the forever file. That’s what it takes. Dave Farland, first reader and lead judge for the Writers of the Future contest talks about “confident writing” as the ineffable divide between professional quality work and “not there yet.” I can’t explain what Dave means by “confident writing” any better than he can, but I understand it perfectly. Read sparkling pro-quality stories until you see it, and then you know what you’re shooting for. What do you think? Have a good resource I should add? Want to suggest another tip? Leave a comment and let me know. Yesterday, I posted about my adventurous emergency wifi replacement. Today, the last puzzle piece fell in place. You might recall that I write at a treadmill desk. You might even recall–if you’re a stalker of some sort–that I don’t use the wifi on the Dell Inspirion All-in-One computer mounted to the treadmill. The Qualcomm Atheros AR9485 wireless network adapter in this machine is universally reviled and, when packed inside the radio-noise infested confines of the All-In-One computer, it’s utter garbage. Seriously, Dell. What were you thinking? I choose this little dude for one simple reason: it has a cat5 connection. It’s also handy that it plugs right into the wall, so no shelf space is needed. The extender is simplicity itself. You plug it in, tell it how to connect to your network, and it broadcasts its own dual-band wireless ac networks that more distance devices can connect to. Nice, if you need that. I turned the extended wireless off. All I want is the cat5 cable connection to my treadmill workstation. Done. And using my little chromebook running xubuntu over the Netgear’s AC wifi? Up to 56Mbps! Apparently, Netgear routers work on sorcery. My cable connection is only 10Mbps. So, I have a new wifi router. TECH WARNING. TECH WARNING. TECH WARNING. Day before yesterday, as I’m getting ready to go to bed early for a 3 am work call that I am facilitating, the network craps out. Actually, the wireless is fine, but the router can’t reach the Internet. Great. Comcast is very helpful, and although my cable modem appears to be working fine, suggests it, being near end of life, might be causing a problem. Great. World’s fasted trip to Best Buy later and I have a new cable modem. Naturally, that’s not the problem.The problem is the ASUS RN66-U Wireless N router I bought last year. They’ll repair it of course, like I can wait weeks for that to happen. So I run my work meeting over cat 5, with no phone, sitting in the closet with the modem. Then I have to drive the kids to school and attend a half-day mandatory training. Swell. Thank God for coffee. I still have another 3 am call coming up. On the way home, I swing by Office Depot and buy a Netgear – Nighthawk X4 AC2350. This has high ratings, excellent coverage, whole new level of speed, great. Get it home. There’s no power adapter in the box. THERE’S NO POWER ADAPTER IN THE BOX. THE MAMBO-FRICKEN GROVER-LOVING FRICKEN FRAPPIN BOX HAS NO COTTON-PICKIN POWER-FLIPPIN GERBIL-FLICKIN POWER WHACKIN ADAPTER. IN IT. So I run back to the Best Buy and buy another one from them ($30 cheaper). In the car, I carefully open it and find the power adapter inside. Excellent. Then I drive next door to a different Office Depot, and they are nice enough to take the return with no fuss. Yeah, I know, the manufacturers hate it when you do that. They want you to mail it to them and make them look good to their distributors, LIKE THAT’S GONNA HAPPEN. So on two hours sleep and a gallon of coffee, I set it up. It’s ginormous, like a pizza box had a love child with a horseshoe crab. It’s so big it won’t fit on the “wiring shelf” I put in the closet. I hung it on the wall, accepted the defaults, and calldc it a night (okay, an afternoon). So great. We’re back in business. Today, I put it through it’s paces. True to the hype, this thing puts out enough radio jazzam to light up a fluorescent tube at twenty paces. By which I mean, I can connect from the sidewalk, a house away in either direction. Not just connect, but get 13 GB per second download speed. Nice. Inside? What the…56Mbps? I only have 10Mbps service! I assume the cable company is just giving me extra juice at the moment. They do that, because they have extra capacity to make sure they meet their contracted SLAs. But it’s for real. My Internet is now faster than at the office. If I load Pandora, it’s playing as soon as the page loads, 7 seconds after hitting Enter. My mother always wanted to be an author. She went so far as to give me what she thought was a writerly name and to send a few pages off to an editor who was kind enough to write back with encouragement and advice. In those days, most editors saw it as part of their job to help find and nurture the next crop of writers. Agents would take on new clients and then eat their commission through the first unprofitable, formative years as a writer found his or her wings. In this branded, Internet age, publishers, editors, and agents face grueling competition from every direction. They still try to find and foster new talent, but everything they do must be funded from the profits from the big brands in their portfolio. It’s a dangerous game. If they invest too little in the future, they’ll slowly starve, to much and they’re bankrupt tomorrow. Today, you almost can’t sell a non-fiction book without a built-in audience from Youtube, a contentious term in Congress, or prime-time news coverage of you taking a bullet to save a kitten. And we fiction authors are not far behind. Anyone with a credit card can publish a book. Millions do each year. Publishers, increasingly, struggle to get their big guns out in front of consumers, to say nothing of the little guys or the new guys. So how does this affect you as a reader? In two ways: First, you have your pick of more new reading material than ever before, though must of it, to paraphrase Christopher Hitchens, is that one book that everyone has in him but which, in most cases, is just where it should remain. Second, you can help. Be understanding. Yes, some writers are downright obnoxious in their obsessive desperation to self-promote, but we have to toot our own horn. Any writer who doesn’t maintain a mailing list, who doesn’t add a promotional footer to email and social media interactions, simply isn’t doing his or her job. I try to keep mine simple, tasteful, and whenever possible, humorous, but it has to be done. Spread The Word. Liking and following on social media is awesome–thank you! But you know what’s even awesomer? Sharing. Retweeting. Blogging. When you do that, your peeps can see what you like and your author gets badly needed exposure. Visit Their Website. We built it for you. Visit it and report any problems you see, then sign up for the newsletter, request the freebie, and pass the word to your like-minded friends. Review Their Work. Goodreads and Amazon are just two places where you can rate and review books and magazine issues you like. Reviews help sell all products these days, but they especially help with books by increasing the attention they get online. Have a blog or Youtube channel? Post a review, start a discussion, or just tweet a selfie of yourself with the book–or an “in the wild” photo of the book on a bookstore shelf. God, how we love those. Review the author. Love an author’s latest–and not for the first time? Think of why you like it–what it is that speaks to you–and post on that. One of my favorite parts of my website is a little scrolling list of kind words from readers. Pre-order that Novel. Preorders mean everything to new authors with a book contract. Really. Preorder it. Pre-order a copy for gifting, for the library, for the school. Tie up your friends, er…I mean…talk your friends into pre-or dering too. Nominate us. Attending Worldcon? YOU can nominate for the Hugos and the Campbell. Know all that “Sad Puppies” kerfuffle last year? That was only possible because almost no one ever does. Nominate and vote for awards big and small, international and local. We love that. A lot. Really. Come see us! We authors, we do these things called book signings? You know…you buy or bring a book and we open it up and scribble, “Dear Sally, I was told there would be donuts,” or something like that. Do that. You know what really makes our day? Smiling, happy readers. We love you. Really. We do it all for you. Well, at least half for you. Well you’re in there somewhere, anyway. And if you don’t come see us at Barns & Noble, we’ll have to post another selfie with the barista in the coffee shop, and no one wants that. Seriously. No one. This is an offer from C Stuart Hardwick, not an advertiser. Your email will never be spammed or sold. Check it out–check it out! The nominees are out, and my friends, Beth Cato and Martin L. Shoemaker are up for the Nebula! So proud. So envious. Must write faster! Greetings fellow readers! Allow me to introduce this year’s Writers of the Future Published Finalist, the very lovely, Kate Julicher. Stuart: Hi Kate! It was great meeting you at Superstars earlier this month, tell my readers a bit about yourself. Kate: I’m actually only half of the KD Julicher team. My husband and I collaborate closely – you might say intimately – on everything I write. My role is to be the “hands on keyboard”. We toss ideas around through emails during the work day or on weekend expeditions into the mountains around our home or over dinner. Then I sit down and write a draft, then we edit it together with a fine-tooth comb, lots of wine, and hopefully no need for marital counseling. Oh, and I keep trains from crashing into each other. Stuart: Wow! Any talents or hobbies, aside from the train thing? Kate: I sing a lot. Not professionally, but it seems like once a month someone comes up after church and says “you should join the choir!”. I don’t think it’s because I’m that good, I think it’s just that I’m loud and enthusiastic. Stuart: Enthusiasm definitely counts! So how’d you get into writing? Kate: I’ve always been a writer. I wrote on that “story paper” you get in kindergarten, the stuff with the big lines and space at the top for art. I spent three years in fanfiction as a teenager and then discovered NaNoWriMo, which I’ve done every year since 2002 and only failed once. About four years ago we decided to get serious and went from NaNovelists to working at the craft year-round. Stuart: Ha ha! I remember “story paper.” How long have you been entering WotF? Kate: Two years ago I decided to enter every quarter of WotF until I won or pro’d out. I’ve racked up 4 HMs, 3 finalists. One of those won the Baen Fantasy Adventure contest in 2014. Stuart: All right! Way to go, Kate! Okay, Star Trek or Star Wars? Kate. Yes? I grew up on Star Trek. For a while it was the only thing my parents would let us watch. I saw the whole Star Wars trilogy at one sitting when I was 13 and it really fired my imagination. Right now I am enjoying the new Star Wars movie more than the new Trek movies but I would love to be won back over by Trek. Stuart: Fair enough. Hey…what’s that…who’s shining that light in my eyes? Kate: Definite plotter. If I have a detailed scene-by-scene outline when I sit down I can whip out a first draft in no time flat. That said I leave enough room for my characters to surprise me. Stuart: Very impressive. How do you come up with the outline? Kate: My husband and I throw ideas back and forth at each other for a while. Then I sit down and start plotting in Scrivener. I set up a new project, break things into three acts, and start dumping in the events I know will happen as separate scenes. I use the notecard function to jot down some notes for each scene. I’ll put in placeholders in between the scenes I know about, and start filling in. Usually at this point my writing brain is active and things just start to click. I also like to put in a word count estimate on each scene. If I’ve got multiple POVs, I color-code the scenes. Then I look and say, ok, this part needs to be longer, I need another Lord Evilpants chapter here, etc. After that we’ll ideally go over the outline and make sure it makes sense. Then I sit down to write. If I’ve done this outline right, the writing part is pretty darn fast. I wrote a 120,000-word draft last November for NaNoWriMo, thanks to this system. It’s got some flaws and the pre-writing part can take anywhere from a couple of weeks to months, but I feel like the resulting product is strong. I’m looking to upgrade this process to the next level by incorporating scene/sequel plotting as described in Deborah Chester’s “The Fantasy Fiction Formula” but I only just got that book so I haven’t actually tried yet. Stuart: What’s the nuttiest thing that ever happened to you? Kate: My boss wouldn’t let me quit my job. Stuart: Hola! If you had a superpower other than enrapturing employers, what would it be? Kate: Can I have Hermione’s Time-Turner instead? I work full time, raise my daughter, and try to put in 3-4 hours a day on writing related stuff. As a result I often feel like Bilbo: “Butter that’s been scraped over too much bread”. Stuart: Done! Now where did I put that thing….oh well, here’s a bagel. Er…next question. What was your favorite toy growing up? Stuart: Ha ha! Me too. That tree made it into my upcoming Analog story, in fact. My sister and I were always secret agents looking for missing isotopes–whatever those were. If you adopted a unique wardrobe tag (ala Dr. Who’s scarf/bowtie etc. ), what might it be? Kate: My husband and I had custom-fitting hats made recently by a local hatmaker. He used this steampunk tophat device to measure our heads, and then shaped the hats to our heads. I love my fedora, I wear it every time I go out. Stuart: Tell us about your winning story. Kate: I’ve had three finalists at WotF now and they’re actually all in the same world, though that is not obvious at first glance. Swords Like Lightning, Hooves like Thunder is one of my favorites. It starts with the heroine running desperately from the enemies that have captured her brother. She meets a mysterious stranger and goes on a journey into a strange, exciting new world. This story actually sprang from an offhand reference to a legend that I wrote into an as yet unpublished novel. I started wondering just what that story had looked like to the people who lived it…. Interestingly, my other published story, The Golden Knight, was the second legend referenced in that same novel, and I wrote it for the same reason. Stuart: Do you prefer fantasy or scifi? Kate: You’d think as a software engineer who was reading hard SF at twelve ,that would be my passion, but I’ve been drawn to traditional fantasy. I like stories about duty and honor and sacrifice. I also really like using family, marriage, and relationships as plot motivators, and that tends to work better in fantasy. Stuart: Well awesome, Kate. Enjoy the WotF workhop, it’s definitely a bit of fairytale come true. Follow Kate at www.kdjulicher.com, and check out The Golden Knight at http://www.baen.com/the_golden_knight.